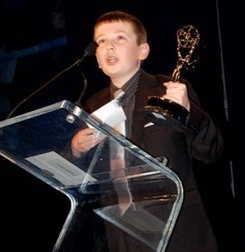 One of Voice Coaches’ youngest students is now a bona fide Emmy winner! Congratulations to 11-year-old Jackson Murphy, who became the youngest person ever to be nominated for – and win – a NY Emmy Award. Jackson trained with Voice Coaches in 2009 to develop his voice over skills and produce his demo. He added VO to his repertoire as a movie critic and the host of his own movie review show, Lights-Camera-Jackson, which airs weekly in the Albany, Syracuse and Binghamton, NY markets on Time Warner Cable’s 24 hour news channels. Jackson competed for the Emmy in a tough market, and he was awarded at a ceremony that was also attended by celebrities such as Paula Zahn, Dr. Ruth, Richard Belzer, Orlando Jones, and Sara Gore, among others.